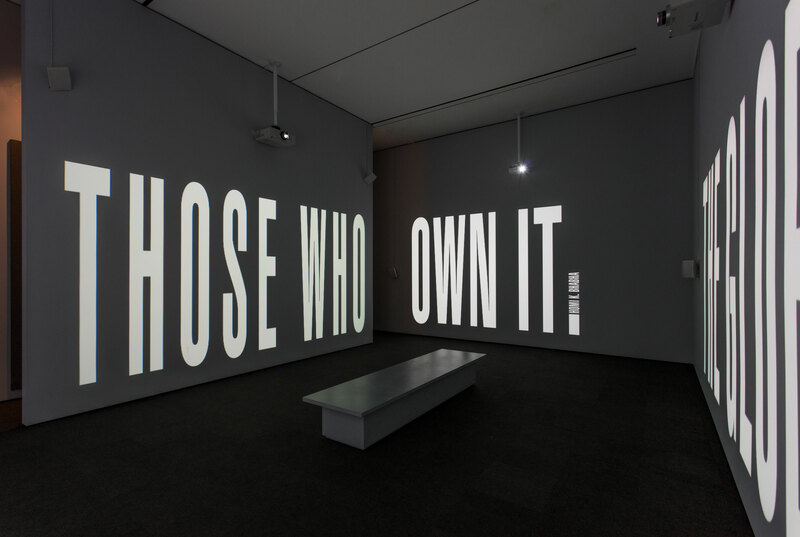 This selection of video installations from the Hammer Contemporary Collection features major works by American artists Charles Atlas, Barbara Kruger, and Kara Walker created in the last decade. Using very different strategies of montage, direct address, and narrative imagery, respectively, each of these artists is among our most eloquent social critics. 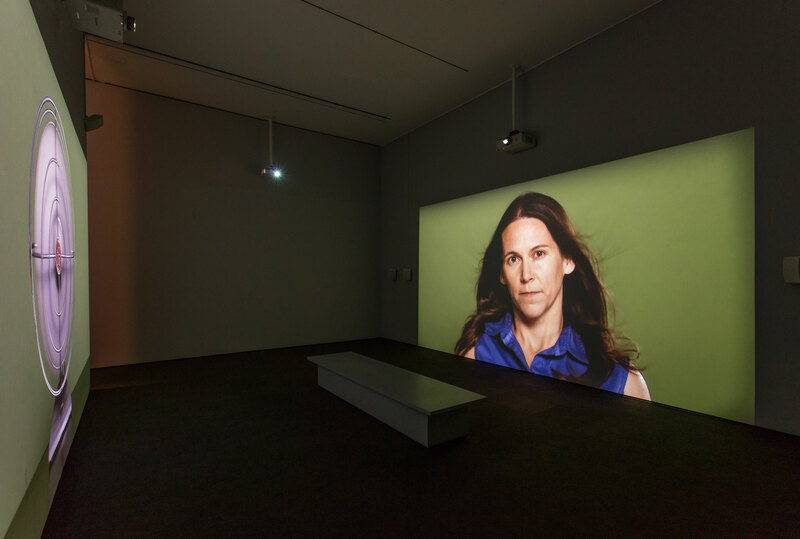 Atlas’s work is comprised of a five-channel video installation titled The Tyranny of Consciousness, which was featured in the 2017 Venice Biennale. 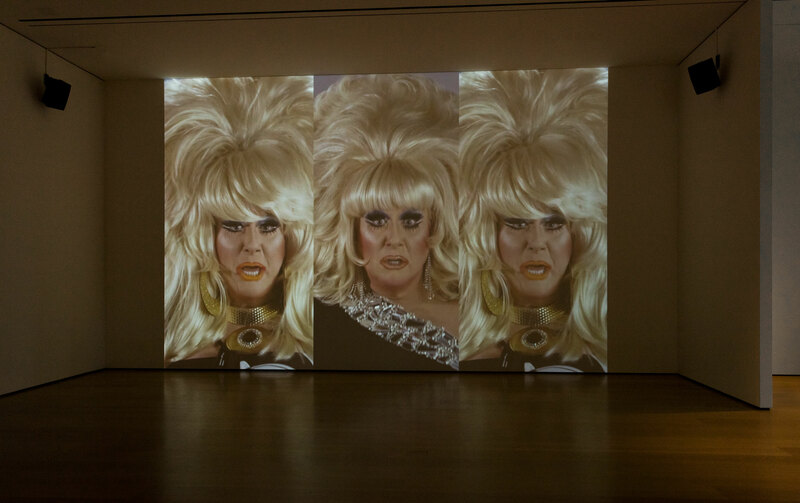 The central montage consists of saturated images of 44 sunsets with an overlay featuring the voice of legendary drag queen Lady Bunny. In what seems to be a stream of consciousness rant about life, peace, avarice, greed, and the future of our planet, she fills the screen and the space with the urgency of her ruminations on our complex and disturbing times. 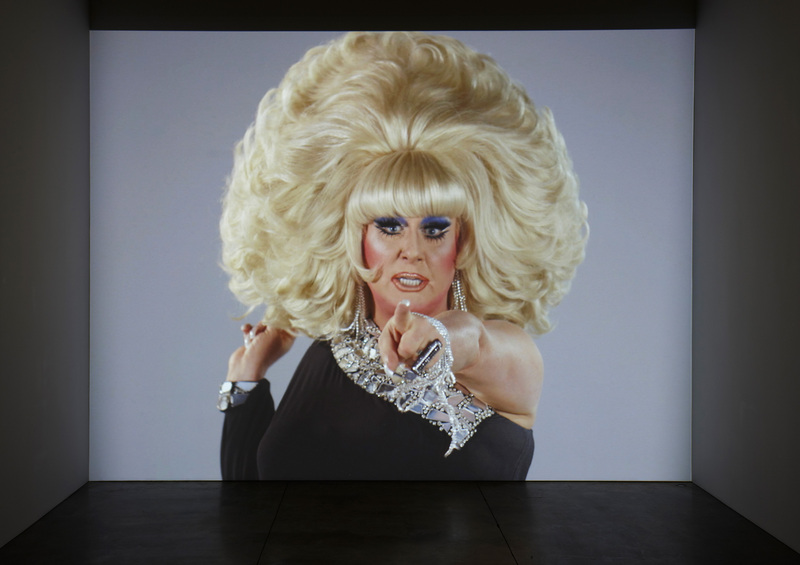 Known for her enormous blonde wig and larger than life personality, Lady Bunny appears at the end of the video cycle when she sings a disco song filled with longing and love. 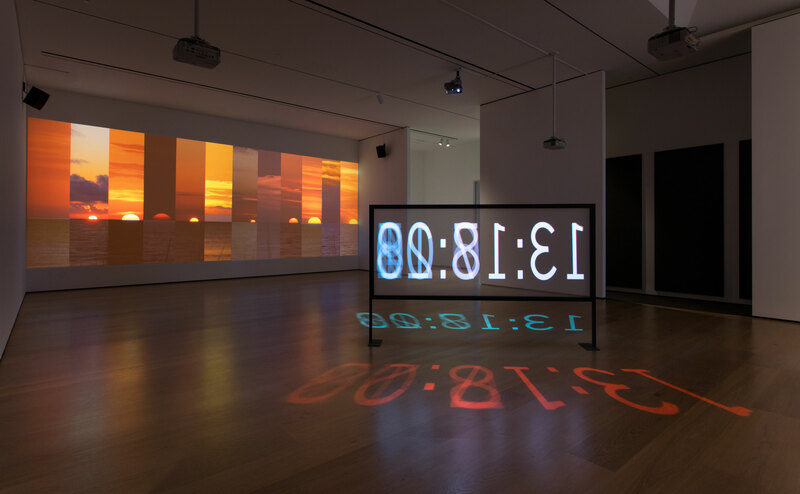 A huge digital clock appears on an opposing screen counting down from 18 minutes to zero, the approximate time it takes the suns to set. Kruger’s The Globe Shrinks is a four-channel, 13-minute compilation of video and text that narrates, in a series of scenes and skits, the conflicting coexistence of kindness and brutality. In this work, the “you” that Kruger’s texts often accost momentarily becomes an “us” as she juxtaposes scenes of different people’s everyday interactions. She pairs both tense and intimate performances, putting emphasis on the possibility of agency rather than the inevitability of exploitation. She invites us to consider the impact of our seemingly banal daily activities and communications by highlighting their nuances. Drawing her title from the cultural theorist Homi Bhabha, who theorized that “the globe shrinks for those who own it,” Kruger reminds us of our common humanity through brief moments of sincerity. 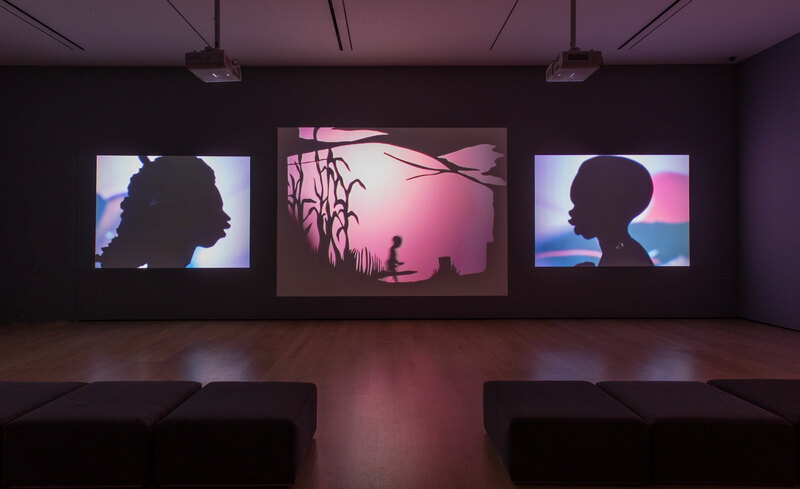 Walker has become one of the strongest voices in contemporary art dealing with race, humanity, and the deep wound of slavery as it has shaped the West. …calling to me from the angry surface of some grey and threatening sea. I was transported is a five-channel installation that touches on the Civil War, the slave Sally Hemings, the artist’s studio, and the genocide in Darfur. 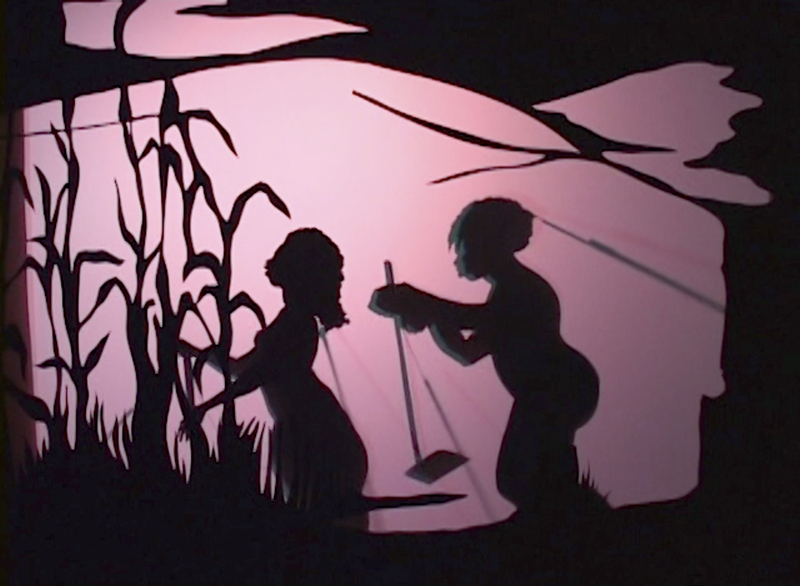 In this work, Walker’s signature silhouettes playing out haunting emotional vignettes are flat hand puppets set against vividly colored backgrounds, accompanied by a soundtrack of country music. 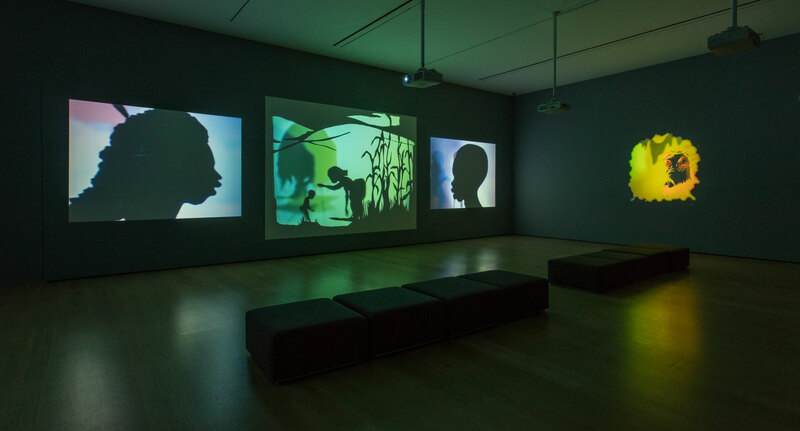 Walker’s silhouetted figures began to animate her video works in 2004, and their active movements add emotional depth to the stories of trauma they tell. Working on the scale of history painting, Walker puts bodies in pain and transformation at the forefront of our consciousness. Unspeakable: Atlas, Kruger, Walker: Hammer Contemporary Collection is organized by Connie Butler, chief curator, and Ann Philbin, director.